Sony on Tuesday unveiled a Limited Edition Gran Turismo Sport PlayStation 4 console bundle. It will go on sale from October 18 in the UK, Europe, and Australasia, alongside the launch of the Polyphone Digital-developed Gran Turismo Sport game. So far, no pricing for the Gran Turismo-themed PS4 console bundle has been revealed. Apart from the console bundle, company alongside unveiled a standalone Limited Edition DualShock 4 controller, apart from the controller with a standard copy of the game. 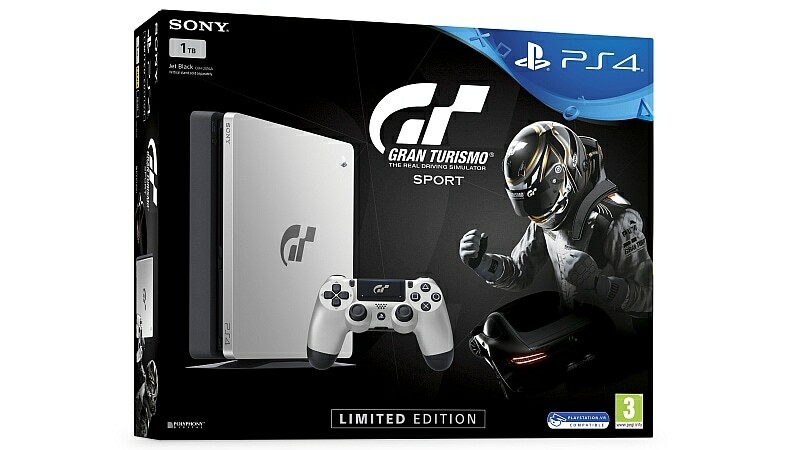 The Limited Edition Gran Turismo Sport PS4 console bundle features a 1TB console with a silver faceplate and the GT logo, apart from a customised silver DualShock 4 wireless controller that also features the logo on the touchpad. The limited edition console is bundled with the Day 1 edition of the game, which has $250,000 in-game credits, livery sticker packs, a chrome racing helmet, and 60 PS4 avatars. Separately, Sony also announced four other bundles that would give buyers a standard copy of Gran Turismo Sport alongside – Jet Black PS4 1TB Edition, Jet Black PS4 500GB Edition, Jet Black PS4 1TB + extra Jet Black DualShock 4 edition, and Jet Black PS4 Pro Edition. To recall, Gran Turismo Sport is a much-delayed game, original due to release in November last year. It will now release on October 17 in the US, and October 18 in Europe and India. The Gran Turismo Sport standard edition is priced at Rs. 3,499 in India and $60 internationally, while the Gran Turismo Digital Deluxe Edition costs Rs. 4,449 in India and $80 internationally.